Our Spring Summer issue is a keeper. Our beautiful fashion features, Bohemian Rhapsody and Candy Couture, are filled with gorgeous wedding dresses by Vera Wang, Claire Pettibone, Lazaro, R-Mine Bespoke and more. Plus, get inspired by hundreds of decor and floral ideas, real weddings, and more. 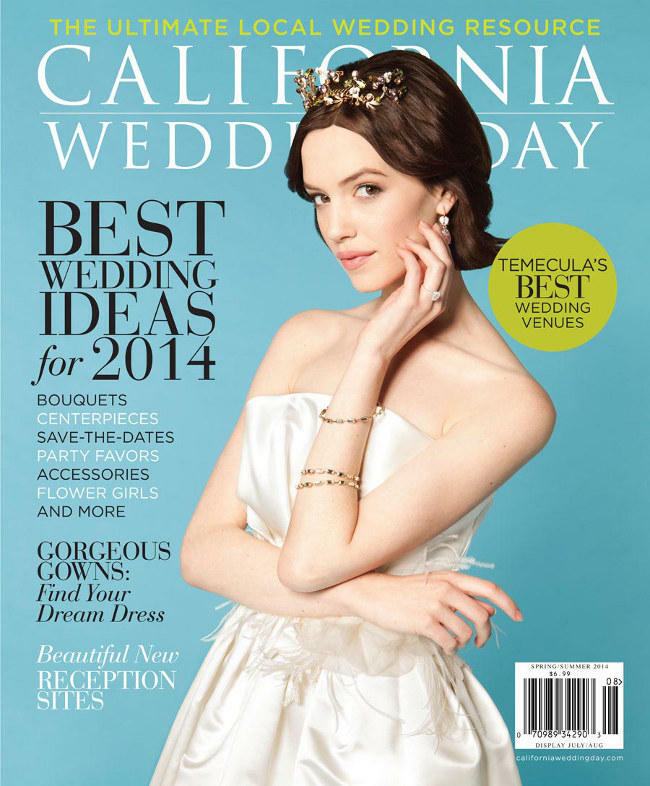 Plus, Southern California's top wedding photographers share their secrets, our favorite destination spa trips for the bridal party and the insider's guide to planning a wedding in Temecula. We just love mixing a bit of glamour with a touch of bohemian styling. Lively hues of aqua, coral and mustard yellow set the scene for high school sweethearts Lauren Redberg and Tom Bernal’s nuptials at her parents’ property in Paso Robles. Being a flower girl in a wedding is a momentous occasion for a little one. Unfortunately, the overwhelmed bride tends to overlook the starstruck flower girl. Tahoe City–based Merrily Wed looked to Mother Nature when contemplating Katie Witmer and Chris Jones’ Ritz-Carlton wedding in Lake Tahoe. The hills are alive with the sound of machinery. Nestled within the hills of Sonoma County’s Dry Creek Valley, the appeal of Healdsburg’s Madrona Manor is evident within seconds of driving through the hotel’s arches. Win A Stylish Wedding Planner from Erin Condren! Tick-tock, brides! It’s time to get all your meetings,notes and thoughts organized in one chic and tidy package. Nothing could be dreamier than saying “I do” in a gown by famed designer Ines Di Santo. Upon your first visit to Temecula, you’ll be awestruck by the seemingly endless miles of mountains and grapevines, which produce 50 different varietals. On their first anniversary, Jordan Katnik took Bryan Raber to The Standard Downtown in Los Angeles for a surprise dinner. A Brit and an American, once separated by 5,500 miles, fell for each other after serendipitously meeting on Venice’s Abbot Kinney Boulevard. It was love at first sight when third-grader Ryan Hopkins met sixth-grader Stephanie Rasmussen. Brigid and Brad began their journey together one fateful night at a mutual friend's house when their eyes locked and smiles stretched across both of their faces. Michelle and Moose' lives ran parallel to one another for years, yet never crossed paths.